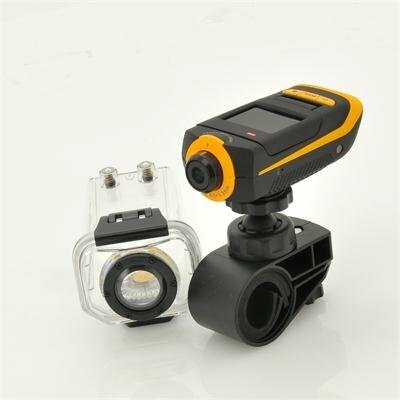 Successfully Added Full HD Extreme Sports Action Camera "ProView HD" - 1080p, Waterproof Case, HDMI, 4 Mounting Accessories to your Shopping Cart. Designed for surfers, skaters, motorcyclists, bikers, base jumpers, snowboarders and anyone else who wants to capture high definition videos of their most extreme moments, the “ProView HD” sports action camera is capable of recording in the most extreme conditions. Attach it to your helm, to your surfboard, on your bike’s handlebar or strap it around your waist and shoot your breathtaking action from up close. The “ProView HD” Sports camera captures 1080p Full HD (1920x1080) video with amazing clarity and thanks to the extra wide 170 degree viewing angle, you’ll be able to shoot great cinematic views. 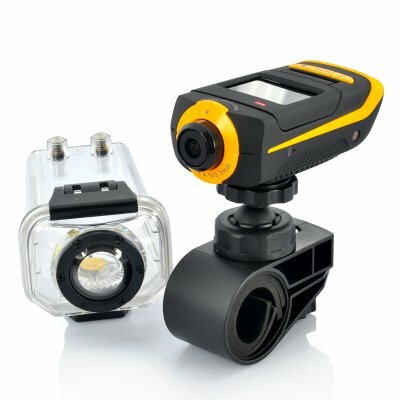 Its waterproof case provides ultimate protection against impacts and can take the camera to depths of up to 15 meters! As a great extra, the provided remote control lets you wirelessly start and stop the recording which can then be viewed on the “ProView HD’s” 1.5 Inch flip-up screen. Never before has a sports camera kit been so complete! On top of that, the “ProView HD” rocks some revolutionary features such as an anti shake function in case you find yourself on rough terrain and a built in G sensor which senses when the camera is upside down and automatically adjust the image accordingly.